RTF Lab Freezers are designed for scientific, clinical, and industrial use. They are equipped with heavy duty hermetic compressors and direct airflow cooling systems and maintain a standard operating temperature of -20°C within +/-1°C. 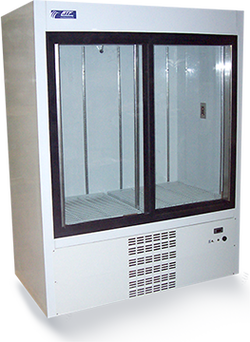 RTF Lab Freezers are available in eight cabinet sizes to fit a variety of space and storage requirements. All models meet UL standards for safety and performance. White enamel, beige enamel, or stainless steel finishes. Microprocessor-based electronic temperature control maintains operating temperature within +/-1°C. Forced air circulation to maintain even temperature throughout the interior. Electric condensate removal to eliminate drain lines. Industrial grade hermetically sealed compressor with sound insulation to reduce noise. High density CFC-free urethane foam insulation. Double-pane glass doors to reduce condensation buildup. High output fluorescent interior lighting. 115V 60A single phase power supply (other voltages available). ​Design or specifications subject to change without notice. Microprocessor-based audio/visual alarm system with high- and low-temperature set points. Automatic phone dialer for alarm system. Temperature recorder with seven day chart and battery back‑up.